The latest edition of Myanmar Script Learning Guide has improved format with larger font size for small devices, and it now comes with more than 740 MP3 Audio recordings in seven pages of FREE ONLINE AUDIO SUPPORT. 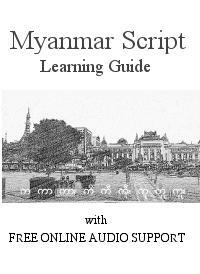 Audio files for Myanmar Script Learning Guide (PDF) are zipped for easy download and offline study. A summary text file with audio file names in English Romanization and Burmese script. Learning to read and pronounce Burmese script is the first step towards understanding the meaning behind the written words, and a necessary step towards competency in writing or typing in Burmese. In this lesson, I will introduce you to the characters and a system of pronunciation designed to help you to read Myanmar written words in the shortest possible time. If you are the first time learner who has never seen the Myanmar written words, my recommendation is to start with the recognition of characters and know the basic rules and general spelling patterns rather than memorizing everything. In this stage, you may not remember how all the characters and symbols are pronounced when put together, but you should be able to refer back to the reference guide, and at least be able to get the close pronunciation. My guess is that will be sufficient for most tourists and visitors who need to find out the pronunciation of just a word or two out of curiosity or necessity. It should be noted that pronunciations of some words do not necessarily follow the way they are spelled. For example, the word Pagoda is spelled "Bu1 Ya3", but read "Pfa1 Ya3". Historical evidence suggests that Myanmar Script has existed at least as far back as 11th Century Bagan Civilization. The living historical evidence is the 12th century Mya Zedi Pillar Script engraved in Mon, Myanmar, Pali, and Pyu languages. It is possible that some variants of Brahmi and Pyu script of the earlier Pyu city-states were in use in Bagan before adapting to the Mon script by King အနော်ရထာ | a-nau2-ra1-hta2 to transfer the knowledge of Tharavada Buddhism from the Mon. 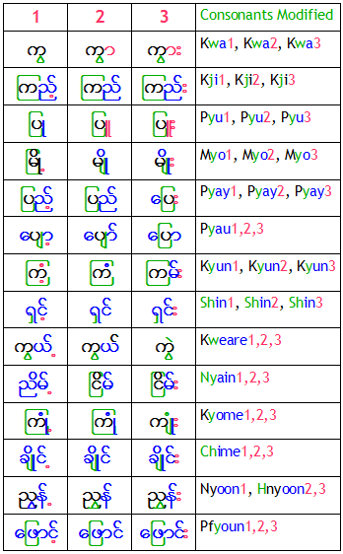 Analysis of the COMPARISON TABLE OF MYANMAR, MON, PYU, AND BRAHMI SCRIPTS in the Myanmar-English dictionary published by the Department of the Myanmar Language Commission shows that 11th century Myanmar Script is closer to the Mon Script than Pyu script. But, note that Old Mon Script has missing 12th, 14th, and 32nd characters ဌ - ဎ - ဠ , which look more like variants of Pyu and Brahmi. Pyu script, just like Mon Script, is derived from the original Brahmi script of ancient India shown in the left column of the table. To give a sense of timeline in history, Ancient Pyu script was in use as far back as 4-6 AD. In comparison, Old English based on Latin script was introduced to the Anglo-Saxon people of England in the 7th century, and Modern English began in the late 15th century. The works of William Shakespeare dated back to the early 17th century. Dr. Judson, an American Missionary, who made a thorough study of the Burmese language theorized in his book GRAMMAR OF THE BURMESE LANGUAGE, published in 1883 that Burmese alphabet is modification of the ancient Nagari Script just like Pali, but not a modification of Sanskrit. However, it should be noted that Sanskrit is the Language just like the Pali, and both the languages can be written in different scripts including Nagari, Devanāgarī, or even in modern English and Burmese. Nagari is said to be the old term for Devanagari, which itself is the Brahmic family of scripts, so most researchers today will agree with Dr. Judson. As seen in the COMPARISON TABLE, The shapes of several Burmese characters had evolved throughout the centuries to the present day print form. With the rise of "Bamar" people, Burmese script became the dominant script replacing Mon and Pyu in the land of what is known as Myanmar today. By the 18th century with the advent of printing, the shapes of all the 33 main characters had become almost identical to the present day characters. The first Burmese book: Alphabetum Barmanum sev Bomanum Regni Avae Finitimarumque Regionum was first printed in 1776 AD (1138 Burmese Calendar year) in Rome by Typis Sacrae Congreg. de Propaganda Fide (Sacred Congregation for the Propagation of the Faith.) It is said to contain 60,000 Burmese typographic characters. 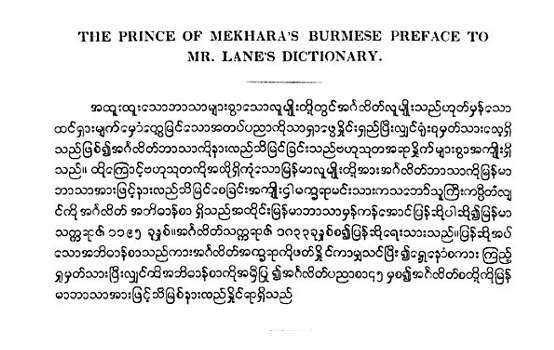 The first English to Burmese dictionary by the Englishman Charles Lane with the help of Burmese prince မက္ခရာမင်းသား | met-kha1-ya2 min3-tha3 was published in 1841. 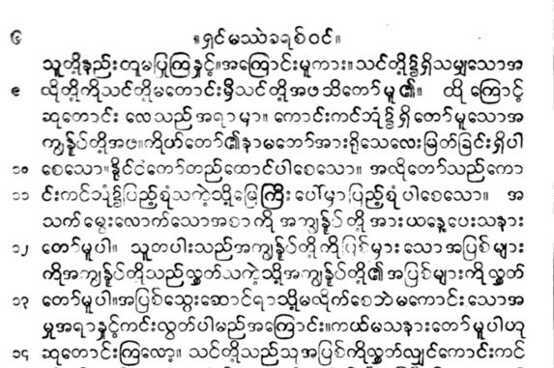 The sample below shows the printed Burmese Script from this dictionary. Although some of the spellings have changed since then, the characters have the same shapes as the present day computer fonts. Also note that the 27th Burmese character ရ | Ya1 in the Prince's name was pronounced with "R" sound instead of "Y" as met-kha1-ra2. Yadanabon Naypyitaw Newspaper was first published on 24 March 1874 by Yadanabon Naypyitaw Press in Mandalay during King Mindon era. Today, just about anyone with a computer using Burmese font can print in Burmese. There are some slight variations among different font types and some deviations in ratios of the shapes can be seen. For example, designers of the Thanlwin font used in this website made the smaller curves within the characters less conspicuous to the extent that the 22nd character ဖ | pfa1 almost looks like the 21st character ပ | pa1. The spelling of Burmese words are standardized today by the Myanmar Language Commission. You need browser version of at least IE 9.0, Chrome 4.0, Firefox 3.5, Safari 3.1, or Opera 10.0 to view Burmese font on this website properly. Does your browser meet the requirement? I was impressed with Thanlwin font and Ekaya Input Method which is not only Unicode compliant but also rendered difficult-to-spell double-stacked words and Buddhist texts correctly, so I have switched to Thanlwin from an another font type. In earlier days, users need to have the font downloaded first into their computers, and in addition, browser options must be changed. Fortunately, the technology has much improved (plus freely available for download or learn online.) For the web page, I am using CSS3 @font-face rule to include and automatically pull "ThanlwinBold.ttf" font. Burmese Script is the later addition to the original lessons. I now have Burmese Script versions of the previous lessons for serious learners of the Burmese language. The following passage is from the play "Water Seller" | ရေသည်ပြဇာတ် | yay2-theare2 pya1-zut by famous Burmese poet, playwright and author U Pone Nya | ဦးပုည | u3 pone2 nya1 during Konbaung Dynasty. If the font display in brown color matches the image below in blue color, the font is working correctly. Burmese language has 33 main letters or characters known as byi3 | ဗျည်း. Those are comparable to 26 alphabets in English, but without uppercase and lowercase differentiation. Each of those byi3 has the sound with the vowel "a" in the first tone. E.g., Ka1, Kha1, Ga1, Nga1, Sa1, Za1, Nya1 | က၊ ခ၊ ဂ၊ င၊ စ၊ ဇ၊ ည၊ and so on. Several of those byi3 have variant byi3 with the same sound and some are seldom used. In additional, Myanmar Written Language has standalone characters, double stacked words thun2-yoat byi3 | သံယုဂ်ဗျည်း or pup-hsin1 | ပါဌ်ဆင့် and other characters outside the 33 main characters that behave almost like byi3. 34 byi3 in byi3 sin2| ဗျည်းစဉ် where sin2 means ordered list. The one extra byi3 shown with the brackets is Nya1 ga1 lay3 | ဉ, which is a Pali byi3 and, is given the same 10th position as the Burmese Nya1 | ည, which in official publication is called Nya1 Ji1 | ညကြီး. 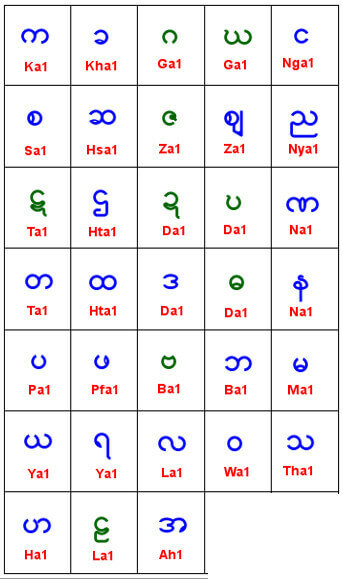 150 possible variations in vowels, tones including 8 single tone groups, combination of closing thut and tones, and standalone characters all lumped under the list of tha1 ra1 + a thut sin2 | သရ နှင့် အသတ်စဉ်. 11 possible combinations of what I termed as "consonant modification symbols" listed under byi3 tweare3 sin2 | ဗျည်းတွဲစဉ် where tweare3 means to append or to attach. All 33 plus one byi3, those listed under tha1 ra1 and thut sin2, and byi3 tweare3 sin2 fall under the category of Et Kha1 Ya2 | အက္ခရာ. Whenever I include Burmese script in my lessons, I will use the "official" spelling, and in case "official" spelling is not available, e.g., new foreign words like website | ဝက်ဘ်ဆိုက်, I will use what is commonly seen in journals and advertisements. However, Romanization with 1,2,3 Tone System is my own creation. "Double Pote Ma1" is also used as a writing style at the end of long articles and essays to indicate the ending. Characters or letters that are more frequently used or seen are highlighted. Simple usage examples are given for each letter. THIS WORD IS SELDOM USED. NOTE: There is a slight difference in pronunciations of the sixth character စ | Sa1 lone3 and the seventh character ဆ |Hsa1 Lain2. The difference will be almost undetectable to the Westerners. Hsa1 Lain2 has more hissing sound produced by the tip of the tongue touching the upper palate. Consonant Modification Symbols neither change the tone nor the vowel ending. Characters remain in the first tone with the vowel "a". Both Ya1-yit and Ya1-pin1 have the same consonant modification effects, and in combination with several characters which can have the same sound, several spelling variations are possible. However, it will be encouraging to know that reading Burmese will be much easier than writing with the correct spelling. Note: Yellow background indicates consonants that are completely modified. Usage examples are given in the right column. ကလေးတို့ရေ လာကြ | kha1-lay3-doh1 yay2 la2 ja1 : come children! NOTE: The example words and phrases on the right column of the above table make use of consonant modified words in their base form, i.e., Vowel 'A1', from which they are further modified and shifted into different vowels and tones. The middle column shows all possible consonant variations in the base "A1" form before tone change and before shifting into different vowels. For single vowel 'A' words with tone variations before shifting into other vowels, please see lesson 36. Vowel shift symbols change the characters and partially modified words into different vowel endings sometimes accompanied by tone change in the new vowel group. The following table shows the general format applicable to several words and it will help you to read the written words. Writing needs a higher skill level as words with correct spelling must be learned through reading or from the dictionary. Au Modify tone with Yay3-cha1 on the right to get "a2". Then use Thway2-hto3 at the left to get "Au3". The first tone is achieved in many vowels by adding a small dot under the character known as out-gah1-myit, or out-myit | အောက်မြစ် . The symbol that looks like a colon (:) called wit-sa1-pout or wit-sa1-hna1-lone3-pout or shay1-gah1-pout at the right side of the character changes the word into the third tone in many cases. Variation in spellings and eight additional distinct sounds are possible using different သတ် | thut that goes on top of different characters. Thut looks like "c" or a small open bracket. Ta1 thut is the thut that goes on top the character "Ta1". Those are the common areas that spelling mistakes are made. NOTE: When thut goes on top of the vowel au sounding words on top of Yay3-cha1, it is called ရှေ့ထိုး | shay1-hto3. 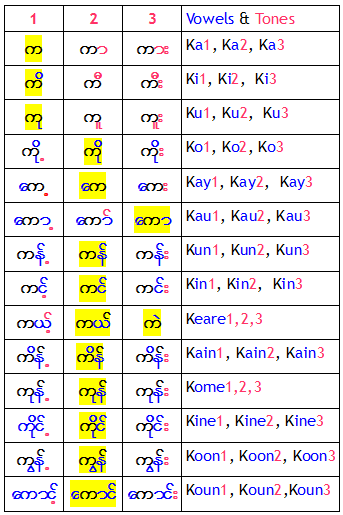 Examples: ကော်၊ ဆော်၊ ဪ | kau2, hsau2, au2. Burmese doesn't have closing consonant sounds so, "Ice" would become "Ike". However, modern Burmese words append Sa1-thut inside the brackets to imitate the closing (s) sound. Similarly, it is possible to spell (ch) and (sh) endings to express foreign words. In some cases, brackets are omitted. For example, "Ford" is spelled with an extra Da1-dway3-thut. "Web" in "Website" is spelled with an extra Ba-gome3-thut. Those are words with double-stacked characters in the middle. Dobule-stacked words are called dway3 bau2 | ဒွေးဘော် or more commonly pup-hsin1 | ပါဌ်ဆင့် where pup | ပါဌ် means Pali word, and hsin1 | ဆင့် means to stack up. Usually, thut is omitted for the character on top. The character below must then be brought up to the same level and combine with whatever that follows. However, in double-stacked word, lower part of Na1 Ngeare2 | န and thut on top are missing. This is followed by the third syllable La1 | လ character itself. It is possible to have Burmese words with more than one double-stacked characters in a sequence. For example, အတ္ထုပ္ပတ္တိ | a-htoat-pup-ti1 means biography. myit-zi1-ma1 | မဇိ⁠္ဈမ - middle as in myit-zi1-ma1 ba1-di1-ba1-da2 | မဇိ⁠္ဈမပဋိပဒါ - The Middle Way (Buddhism). အင်္ဂလိပ်စာ | in3-ga1-late sa2 - English Language. In some words like စကြဝဠာ | Set-kja2-wa1-la2, which means the Universe, the word Ka1 is not double-stacked, but the effect is like a double-stacked word with missing Ka1-thut. It is pronounced as (စက် + ကြာ + ဝ + ဠာ). thout-kja2-nay1| သောကြာနေ့ - Friday is read as သောက် + ကြာ + နေ့. let-ya2 | လက္ယာ becomes လက်ျာ - right-hand side. u1-yin2 | ဥယ္ယာဉ် becomes ဥယျာဉ် - garden. pyin2-nya2 | ပညာ - knowledge. ma1-note-tha1 | မနုသ္သ simplifies to ma1-note-tha1 | မနုဿ - human. Stand-alone characters are not part of the main 33 alphabet (or character) system, but many of those are commonly used in standard official level documents, newspapers, and in literature. The following stand-alone characters cannot be combined with others and they are commonly used in the literary form. ၏ E1 <<MP3 AUDIO>> ending word "to be"
၎င်း | La1-goun3 meaning that or above-mentioned has the character that looks like number 4 or ၄ | lay3 in Burmese followed by Nga1-thut and Shay1-ga1-pout | င်း. Some font makers have considered this word as a single word, so it is faster to type it. The following additional characters outside 33 Byi3 behave almost like the main 33 Byi3 and can be combined with Vowel Shift Symbols and tone Change Symbols. According to my research, the difference between those characters and the main 33 Byi3 is that they cannot be combined with Consonant Modification Symbols (Ya1 Pin1, Ya1 Yit, Wa1 Hsweare3, and Ha1 Hto3). Character ဉ | Nya1-ga1-lay3 is officially shown next to the character ည | Nya1 and is given the same 10th position in the list of 33 Byi3. who serves as a vice-president under U Thein Sein government. refer to combination of "outcome of previous deeds", intellect, and hardwork, which determine the fate of the person. can be directly translated as red and black mind. It means cunning, wicked, and deceptive mind. Ayeyarwaddy River, which the British gave the spelling Irrawaddy River. to address the title Mr.
အံ့ဩ | un1 au3 - to be amazed. ယုဒဿန် | Yu1 Dut Thun2 - Surname "Judson"
As shown in SIMPLIFIED DOUBLE-STACKED WORDS section above, ဿ acts as if double-stacked သ္သ | tha1. ပြဿနာ is equivalent to ပြသ္သနာ, and read as ပြသ် + သ + နာ. which is a double-stacked word with က on top and what looks like smaller ကု at the bottom. ဣန္ဒြေ | Ain2-da1-ray2 - modesty. Example: သျှားထွဋ် အိန္ဒြာ | sha3 htoot ain2-dra2, Sharr Htut Eaindra (female), Miss Myanmar 2014 who participated in the 2015 Miss Universe contest. Likewise အိန္ဒိယ | ain2-di1-ya1 for India is now used for ဣန္ဒိယ mentioned in some older Buddhist literatures. ဣဿာမစ္ဆရိယ | ate-tha2-myit-sa1-ri1-ya1 - jealousy. It has Pali roots ဣဿာ and မစ္ဆရိယ. The first word is jealousy or envy. Although Myanmar-English dictionary by the Myanmar Language Commission defines the second part as envy, it actually means stingy as in ဝန်တို | woon2-toh2. It is "envy" in a sense one does not want to give due credit to someone one is jealous of. "Vowel", by definition is a speech of sound made with the vocal tract open. In English, "A,E,I,O,U" are the vowels. In addition, in written English, the words cannot be spelled without at least one vowel in them. (Exceptions: "by", "my") Burmese vowels သရ | tha1-ra1 by definition is the same. Further analysis shows that many of သရ | tha1-ra1 sounds are just tone differences, such as Ah1 in the first tone, Ah2 in the second tone; E1 in the first tone and E2 in the second tone; U1 in the first tone and U2 in the second tone; Au3 in the third tone, and Au2 in the second tone. In fact, there are only 8 vowel sounds with tone differences out of 12. Those eight distinct sounds are listed under the 150 သရ နှင့် အသတ်စဉ် | Tha1-ra1 and A-thut Sin2 . Burmese အသတ် | A-thut refers to "c" shaped "thut" that goes on top of different characters to close the consonants into different spellings. However, spellings with different A-thut may or may not fall into different phonetic sounds. A-thut has no English equivalent, but can be considered as "vowel shift symbols". Several words formed with different A-thut are homonyms (fall into the same phonetic groups) and redundant from the English romanization standpoint. As for the native Burmese speakers, we learned those tone differences since grade 1 သူငယ်တန်းမြန်မာဖတ်စာ, but no official attempt was made to romanize and standardize those similar to Chinese Hanyu Pinyin, and as a result, you will see all kind of variations online as well as in publications which only add to confusion and mispronunciation of words. Although the 12 traditional Burmese vowels Tha1-ra1, namely: အ - အာ - ဣ - ဤ - ဥ - ဦ - ဧ - အဲ - ဩ - ဩော် - အံ - အို appear to have no linkage to the system of writing as compared to the English vowels A,E,I,O,U, those Tha1-ra1 can be represented by their variations: အ၊ အာ၊ အိ၊ အီ၊ အု၊ အူ၊ အေ၊ အဲ၊ အော၊ အော်၊ အံ၊ အို. According to this line of thought, it is possible for the Tha1-ra1 to become the base for all possible vowel sounds using different thut. It is possible to add tone variations to the row 2 and row 5 of the above table. The system has missing vowel group အွန့်၊ အွန်၊ အွန်း | oon1, oon2, oon3 as well as a single tone အွတ် (အွပ်) | oot group. In comparison, all the possible vowel sounds and tones are covered more efficiently with 1,2,3 tone system consists of 14 vowel sounds each with 3 tones plus 8 single tones. Many words with Pali roots are exclusively used by the Buddhist monks and students learned under the umbrella of Buddhism, and those words remain in the domain of Buddhist prayers and literature. The best teachers will be the abbots in the monasteries. Here's a sample of universal Buddhist prayer in Pali..
Burmese Buddhists are expected to be able to recite Au3 Ka2 Tha1| ဩကာသ, and almost all who grew up in Burma (Myanmar), Buddhists as well as non-Buddhists, will have heard of at least some part of this prayer. ဩကာသ refers to the world, which is close in meaning to the word "the boundless universe" A-nun2-da1 Set-kja2-wa1-la2 | အနန္တစကြဝဠာ where water, land, forests, mountains and oceans, etc., Yay2, Myay2, Tau3, Toun2, Tha1-moat-ta1-ya2 sa1 dthi2 doh1 | ရေ၊ မြေ၊ တော၊ တောင်၊ သမုဒ္ဒရာ စသည်တို့ exist. The following is my translation of the above Buddhist prayer, which is not the "official" translation of any Religious Council or Ministry. homage is made -- Pilgrimage. Also see the translation of Au3 Ka2 Tha1 line by line with romanization. Pali terms are further elaborated in Burmese for those who can read and understand Burmese well. During the time of Burmese Kone3-Boun2 dynasty | ကုန်းဘောင်ခေတ် American missionary Adoniram Judson | ဒေါက်တာယုဒဿန် (1788-1850) was much credited for coming up with Burmese Pali dictionary, Burmese English dictionary (1887) published after his death by American Baptist Mission Press and needless to say, the translation of the Holy Bible မြန်မာဘာသာပြန်ခရိယာန်သမ္မာကျမ်းစာ New Testament in Burmese (1832). Here is the original sample page of passage from Matthew 6:9-13 | မဿဲ ၆ : ၉-၁၃ in Burmese. Your name be kept holy. 12And forgive us our debts as we have forgiven our debtors. COMMENTS: "daily bread" was translated into Burmese as "sufficient food to maintain the livelihood". In some versions of the Bible, the words "trespass" and "trespassers" are used in place of "debts" and "debtors", which is correctly translated in the above Burmese version. Here's something every Burmese Nationals know, and ex-Burmese Nationals all over the world still remember: Burmese National Anthem (နိုင်ငံတော်သီချင်း). Although National flag is now flown in different colors and stripes similar to that of Burmese Nationalists and the Army led by General Aung San in the 1940's, and the name of the country has changed in English from Burma to Myanmar, the spirit and the words behind the Burmese National Anthem remain steadfast in the Land of the Fast and the Strong known as Myanmar မြန်မာ | Myan2-Ma2, or ဗမာပြည် | Ba1 Ma2 Pyay2 as sung in the National Anthem. COMMENTS: The Land of the Burmese People ဗမာပြည် | ba1-ma2 pyi2 is now changed to မြန်မာပြည် | myan2-m2 pyi2 to reflect other ethnic races. Burmese independence hero General Aung San was an avid reader, and known to be talented in writing. In November 1933, still in his college days, he won a competition to translate a passage from English to Burmese under the pen-name ပဲခူးကဝေ | Ba1-go3 Ka1-way2, which appeared in ဂန္တလောက မဂ္ဂဇင်း | Gan2-da1 Lau3-ka1 Magazine. He also had a pseudonym အညာသားလေး | Anya2 tha3 lay3 with which he wrote two articles in June and August 1935 editions of သူရိယ မဂ္ဂဇင်း | Thu2-ri1-Ya1 Magazine. Other articles in his college days include လောကဝိဟာ | Lau3 Ka1 Wi1 Ha2 in 1937 September edition of မျိုးညွန့်မဂ္ဂဇင်း | Myo3 Nyoon1 Magazine where he expressed his opinion on the meaning of education, and ကျောင်းသားဝတ္တရား | Kjoun3 tha3 Woot-ta1-ya3 meaning "responsibility of students" in November 27th 1937 issue of မန္တလေးသူရိယ | Mun3-da1-lay3 Thu2-ri1-ya1. He was then known as တက္ကသိုလ် ကျောင်းသား ကိုအောင်ဆန်း | Tet-ka1-tho2 Kjoun3-tha3 Ko2 Oun2 Sun3. In his earlier years of short political career, Bogyoke Aung San used the pen-name သခင်အောင်ဆန်း | Tha1-khin2 Oun2 Sun3. Articles appeared in ဒဂုန်မဂ္ဂဇင်း | Da1-gome2 Magazine and နဂါးနီစာစောင် | Na1-ga1-ni2 Sa2 Soun2. (Second) World War is about to become a reality. What's the situation like for Burma? What shall we Burmese do? Those challenges appeared in my stream of thoughts one after another. I immediately made a sole determination. I shall leave my life to fate alone and let it be. But, for the independence of my country, I shall struggle fervently and make a fearless venture with a restless heart. Such was the iron determination I made with an unyielding spirit. General Aung San never had the time to write a book during his struggle for independence, but he had indicated the desire to retire from politics and write books after the independence on subjects like politics, history, family affairs and education of children based on his belief system and point of view. The following was what he told တက္ကသိုလ်နေဝင်း | Tet-ka1-tho2 Nay2 Win3 (also known as ဗိုလ်ထွန်းလှ | Bo2 Htoon3 Hla1) in April 1947. One can only wonder what kind of additional contributions he would have made to the elegance of Burmese literature and the spirit of Nationalism. Bogyoke Aung San did not live to see the independence of Burma. He was assassinated in the gloomy morning of July 19th, 1947. Here's a sample of Burmese poem မြန်မာကဗျာ for children. For those who can read and understand Burmese, this will leave you smiling. The Poem was written by ဆရာကြီးမင်းသုဝဏ် | Hsa1-Ya2-Ji3 Min3 Thu1 Woon2. He was born on February 10, 1909, and a poet during Bogyoke Aung San era who was born on February 13, 1915. Added Note: I had this poem in this page a couple of years before U Htin Kyaw was hand-picked by Daw Aung San Suu Kyi to be the 9th president of Myanmar. Only then, I came to realize that he is the son of this poet. Note: Symbols used in vowel shift, tone change, and consonant modifications cannot be used as stand-alone words. Unless you are a scholar who specializes in this field, or a long-term visitor in Myanmar who must know more, just a couple of hours of study should be good enough to get the general idea and be able to spell Burmese words on your own after referring back to the learning guide. Good luck!